No hiking boots and dehydrated food packs required when you go on this adventure. Art trails and open studios are a great way to meet and buy directly from makers within a city area or regional Australia. Both local councils and State governments are actively promoting their creative communities and striving to bring them out of the shadows for both locals and visitors to enjoy. There is a range of art trails available. Some trails such as the Heidelberg School Artist Trail (www.artiststrail.com.au) and the Fleurieu Peninsula Art Trail in South Australia ( http://www.southaustralia.com) are permanent and maps can be downloaded for year round use. Others like The Bathurst Arts Trail (http://bathurstartstrail.com), a collective of artists throughout the Bathurst region, open galleries to visitors on the first weekend of each month. This weekend Willoughby City Council as part of its Spring Festival will be hosting its 10th Open Studio Weekend (www.willoughby.nsw.gov.au/springfestival) and Manly Arts (www.manlyartsfestival.com) is including an art trail as part of their annual festival. Some of our members already participate in these events. If you don’t and would like to have more exposure not only in your local community but Australia wide consider doing research to see if there is an art trails or open studio program in which you can participate. If there isn’t maybe now is the time to get together with fellow artists and ‘blaze a trail’ in your part of the world. 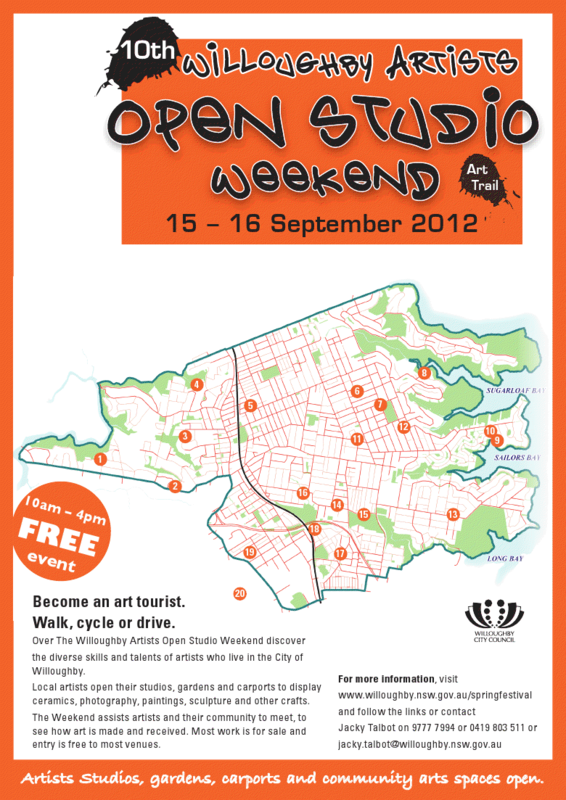 Australian Ceramics Open Studios is here! Connecting and engaging with the Australian ceramics community Create a free website or blog at WordPress.com.